Alpro have a new packaging design for their ambient long life Soya Light and I must say it's a huge improvement. The carton shape is now in line with their chilled drinks (see photo below) and the top of the carton has a gentle downward slope with a much larger screw type lid. It's so much easier to open and hold, and it pours out perfectly. The previous opening design was annoying as the pop up lids often fell off. Also the inner seal had a tendency to partially remain behind after opening which rendered the pouring experience a messy process. The odd thing is that Alpro have also redesigned the openings on their other drinks. Although described as 'new easy open', they're actually different to the new lid on the Soya Light. They're smaller and harder to open because of the high slant of the top of the carton. If you've got long nails or haven't got particularly strong fingers, it's not really that easy to open. Back to the new Soya Light Drink, besides the packaging redesign, for some reason there is also a tiny increase in calories. 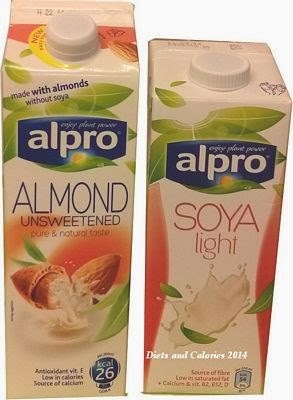 Now 100ml of Alpro Soya Light has 27 calories instead of 26! Everything else is the same and it's still as tasty as ever. Nutrition information per 100ml: 27 calories, 1.6g carbohydrates, 1.4g sugars, 1.2g fat, 0.2g saturates, 0.9g fibre, 0.11g salt. 120mg calcium. Vitamins: Riboflavin, B12 and D2. Suitable for vegetarians. 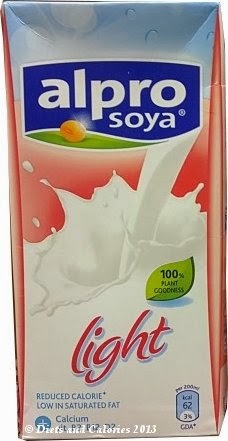 Ingredients: Water, hulled soya beans (4.1%), maltodextrin (Fibre), fructose, sugar, calcium carbonate acidity regulator (monopotassium phosphate), sea salt, flavouring, stabiliser (gellan gum), Vitamins (Riboflavin (B2), B12, D2), Natural flavouring. See previous Alpro Soya Light review here.